I recall hearing once that customers perceive things that are yellow or red as being "sturdier" and "better made." 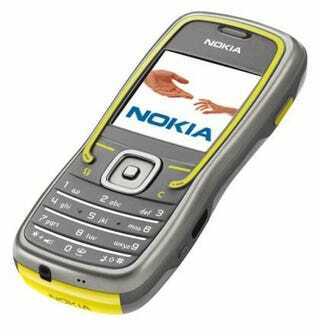 We're not sure about the 5500, Nokia's sporty model with rubber cladding, but it sure looks like it could withstand 4Gs and a brushfire. Interestingly enough, the 5500 actually has a sport mode which includes a training diary and stopwatch. There is a switch on the side which locks the phone into one of three settings, sport, music, and standard. Finally, it has a text-to-speech feature for reading out SMS messages on the run. It's also tri-band and should be in stores this summer for 300 euro. No pricing or US availability, but it looks promising.